Every month, Customs and Border Protection (CBP) releases a Southwest border migration report listing the number of individuals arrested attempting to illegally cross the southern border of the United States. Government agencies and researchers use this data to track patterns of illegal immigration and draw insights, such as determining whether certain policies act as immigration magnets or deterrents. This report uses FY 2017 and FY 2018 data. 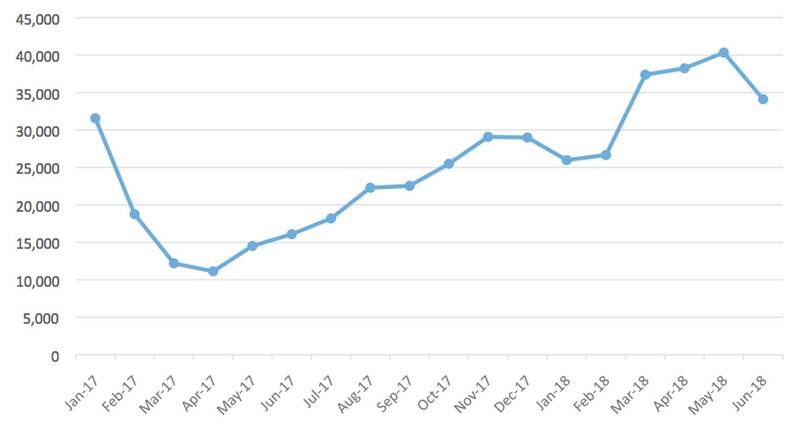 Border apprehensions fell between May and June 2018. Some reporters suggested that President Trump's controversial "zero-tolerance" policy of criminally prosecuting all border-crossers, including those who came with young children, had worked as a deterrent. One piece described the drop in apprehensions as "[signaling] that President Donald Trump's 'zero-tolerance' policy to criminally prosecute every adult who enters the country illegally is having a deterrent effect." In the context of analyzing President Trump's rhetoric and the enforcement actions of the executive agencies, I thought it would be helpful to visualize the ebb and flow of border apprehensions in the months since the inauguration. It is important to note that January 2017 is included, although the Trump administration's first full day was January 21, 2017. Border crossings fell dramatically in the months after Trump's inauguration, likely reflecting that Trump's tough rhetoric in the presidential election indeed acted as a deterrent against would-be border-crossers. The Hill notes that "numbers had dropped sharply in 2017, the first year of the Trump administration, breaking recent seasonal patterns." 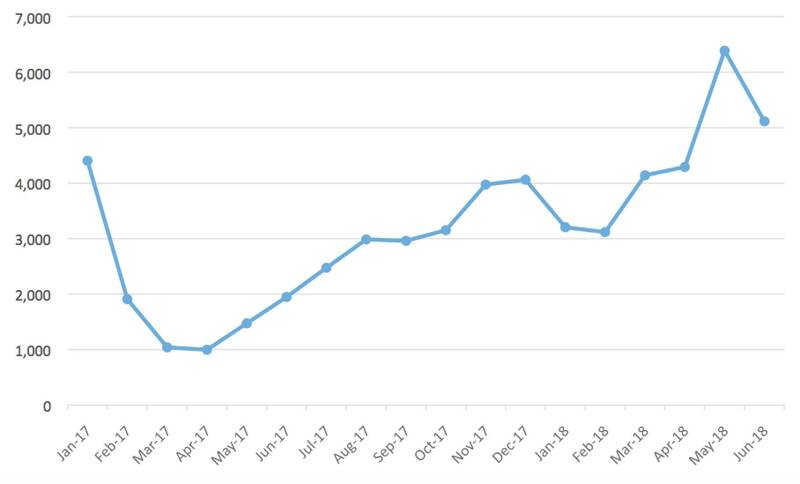 Indeed, border apprehensions did not reach pre-Trump levels until March 2017, when they again peaked at over 30,000 per month. The June total is higher than it was in January 2017, when Trump took office. The trend under Trump is easy to spot. Shortly after the inauguration, Trump's fiery rhetoric and flurry of executive orders deterred aliens from trying to make the journey. However, as time went on, many would-be migrants took note that not all that much had changed since Trump became president. Court hiccups, defiant sanctuary jurisdictions, and the lack of a physical barrier signaled that while the talk was tough, the actual differences in enforcement were small. The "zero tolerance" announcement was an effort to further deter illegal aliens, but the policy was scrapped over mounting political pressure due to the controversy of separating children from their parents who were facing criminal prosecution. 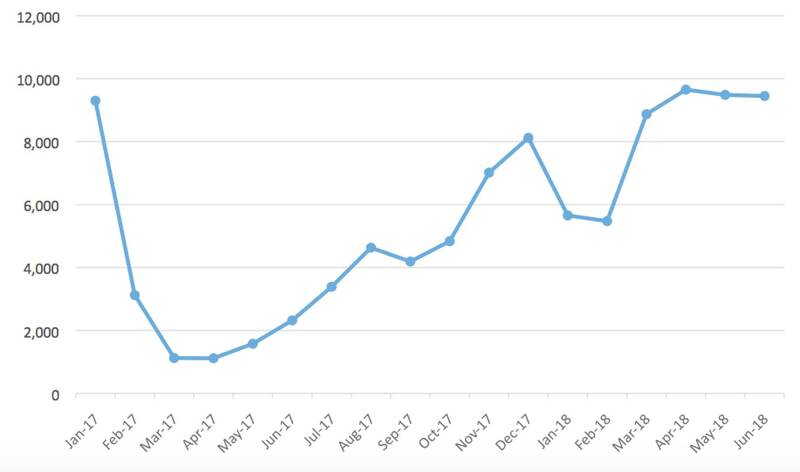 That may explain why the number of unaccompanied alien children (UACs) fell sharply as well, although the June 2018 total is still well above the January 2017 total. It stands to reason that people would not pay smugglers thousands of dollars to traffic their children to the north if they were under the impression it was likely they would be caught and subject to harsh penalties. Did the zero-tolerance policy actually deter families from bringing their children over the border to use as shields against enforcement? The data is not clear. Any deterrent effect wrought by zero-tolerance should be noticeable in the family-unit apprehension data, as it is for UACs and the overall total. Throughout Trump's term, the instances of family units crossing the border — i.e. illegal-alien children with accompanying adults — drastically fell, from a high of 9,300 in January 2017 to a low of 1,126 in April 2017. It remained below 5,000 monthly, but crept up slowly from May through October. It shot up in November to over 7,000, dipped below 6,000 the following two months, and then rose again. April, May, and June 2018 had more monthly family-unit apprehensions than there were in the beginning of Trump's administration in January. This could mean that the "Trump deterrent effect" (Trump's rhetoric stopping would-be illegals) has worn off. Take the month of April for example. In 2017, apprehensions of family units totaled only 1,118. One year later, they totaled 9,652 — an increase of 763 percent. The zero-tolerance strategy was unveiled on May 7, 2018, and ended on June 20, when President Trump signed an executive order halting the end of family separation, eroding the strongest provisions of the initiative. If the policy had a deterrent effect, it was not noticeable in the family-unit data between May and June 2018. Apprehensions fell in those months, but only slightly — from 9,485 to 9,449. The family-unit apprehensions show much more stability than that of the total apprehensions. We will need to see one or two more months' worth of data to draw a final conclusion regarding the effect (if any) the zero-tolerance policy has had on apprehensions in the Southwest. But a few trends stand out. First, total and UAC numbers fell, although they remain higher than when President Trump began his first term. Second, family-unit apprehensions did not show any effect and remained above 9,400 family units per month, also higher than when President Trump took office. The story of apprehensions under Trump so far indicates a genuine rhetoric-based deterrent in his first year that generally has gone away since. Now, Southwest border apprehensions are higher than when he took office, indicating that aliens may be feeling more comfortable making the journey to the United States.